How does kidney dysplasia happen? What are the signs or complications of kidney dysplasia? How is kidney dysplasia diagnosed? How is kidney dysplasia treated? What is the long-term outlook for a child with kidney dysplasia? 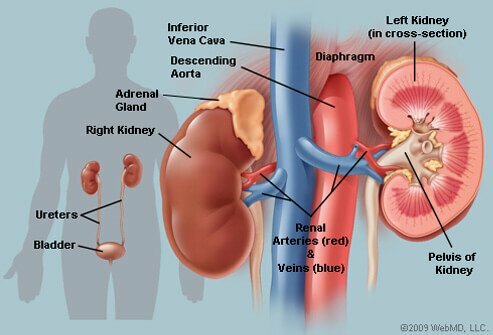 The kidneys are a pair of bean-shaped organs that filter fluid and wastes from the blood to form urine. Urine flows from the kidneys to the bladder through tubes called ureters. Kidney dysplasia is a condition that can occur in babies while they are growing in the womb. 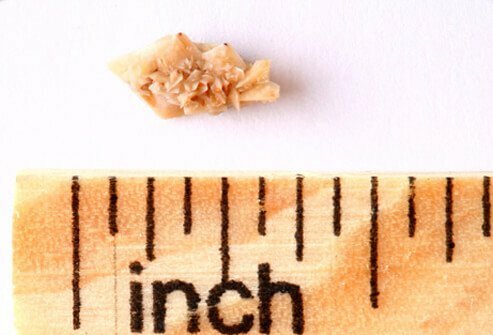 Other terms that health care providers and scientists use to describe this condition are renal dysplasia and multicystic dysplastic kidney (MCDK). In kidney dysplasia, the internal structures of one or both of the baby's kidneys do not develop normally. 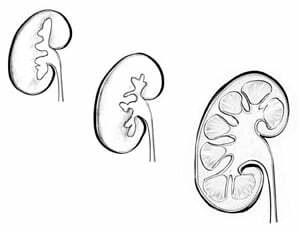 Fluid-filled sacs called cysts replace normal kidney tissue. Kidney dysplasia usually happens in only one kidney. A baby with one working kidney can grow normally and has few, if any, health problems. Babies with kidney dysplasia affecting both kidneys generally do not survive pregnancy, and those who do survive need dialysis and kidney transplant very early in life. 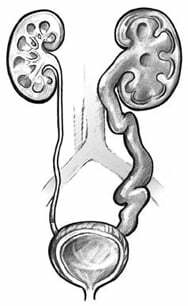 Ureters are tubes that grow into the kidneys and branch out to form a network of tubules that will collect urine when the fetus is developing in the womb. 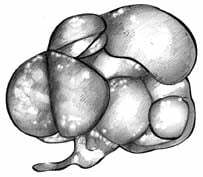 In kidney dysplasia, the tubules fail to branch out completely. The urine that would normally flow through small tubules has nowhere to go, so it collects inside the affected kidney and forms cysts. During normal development, the tubules that collect urine branch out throughout the baby's kidneys. In kidney dysplasia, the tubules fail to branch out, and urine has nowhere to go. The urine collects inside the kidney and forms cysts. Kidney dysplasia may be caused by the mother's exposure to certain drugs or by genetic factors. Pregnant women should talk with their health care providers before taking any medicine during their pregnancy. Drugs that may cause kidney dysplasia include prescription medicines, such as drugs to treat seizures and blood pressure medicines called angiotensin-converting enzyme (ACE) inhibitors and angiotensin receptor blockers (ARBs). A mother's use of illegal drugs-such as cocaine-can also cause kidney dysplasia in her unborn child. Kidney dysplasia can also have genetic causes. The disorder appears to be an autosomal dominant trait, which means one parent may pass the trait to a child. When kidney dysplasia is discovered in a child, an ultrasound examination may reveal the condition in one of the parents. Several genetic syndromes that affect other body systems may include kidney dysplasia as one part of the syndrome. A syndrome is a group of symptoms or conditions that may seem unrelated but are thought to have the same cause-usually a genetic cause. A baby with kidney dysplasia might also have problems of the digestive tract, nervous system, heart and blood vessels, muscles and skeleton, or other parts of the urinary tract. A baby with kidney dysplasia might have other urinary problems that affect the normal kidney. On the left, urine is blocked from draining out of the kidney. On the right, urine flows backward from the bladder into the ureter and kidney, a condition called reflux. Problems of the urinary tract that lead to kidney dysplasia might also affect the normal kidney. For example, one urinary birth defect causes blockage at the point where urine normally drains from the kidney into the ureter. Another birth defect causes urine to flow from the bladder back up the ureter, sometimes all the way to the kidney. This condition is called reflux. Over time, if these problems are not corrected, they can damage the one working kidney and lead to total kidney failure. The affected kidney may be enlarged at birth. Abnormalities in the urinary tract may lead to urinary tract infections. Children with kidney dysplasia may develop high blood pressure, but only rarely. Children with kidney dysplasia may have a slightly increased risk for kidney cancer. Chronic kidney disease and kidney failure may develop if the child has urinary problems that affect the normal kidney. Many children with kidney dysplasia in only one kidney have no signs or symptoms. Kidney dysplasia is often found during a fetal ultrasound, also called a sonogram, during pregnancy. Fetal ultrasound uses sound waves to create images of the baby growing in the womb. However, the condition is not always detected before the baby is born. After birth, an enlarged kidney may be detected during an examination for a urinary tract infection or other medical condition. If the condition is limited to one kidney and the child has no symptoms, no treatment may be necessary. Regular checkups should include blood pressure measurements, blood tests to measure kidney function, and urine testing for protein. Usually the child is monitored with periodic ultrasounds to look at the affected kidney and to make sure the other kidney continues to grow normally and doesn't develop any other problems. Children with urinary tract infections may need to take antibiotics. Many children with kidney dysplasia in only one kidney grow into healthy adults without any problems. The dysplastic kidney may shrink as the child grows. By age 5, the kidney may no longer be visible in x-ray or ultrasound examinations. Children and adults with only one working kidney should have regular checkups for high blood pressure and kidney damage. A child with urinary problems that lead to kidney failure may eventually need a kidney transplant or blood-cleaning treatments called dialysis. Does my child have any other problems in the urinary tract? Does my child need to take antibiotics to prevent urinary tract infections? How often should my child be checked for high blood pressure and kidney damage? How often should the dysplastic kidney and the normal kidney be evaluated by ultrasound? Kidney dysplasia is a condition that happens while a baby is growing in the womb. Kidney dysplasia usually affects only one kidney, making it unable to function. Many people lead healthy, normal lives with only one functioning kidney. A child with kidney dysplasia affecting both kidneys may not survive outside the womb. If the child does survive birth, early dialysis and kidney transplant will be needed. The mother's exposure to certain drugs may cause kidney dysplasia in her unborn baby. Children and adults with only one working kidney should have regular checkups for high blood pressure and kidney damage. Children with urinary problems in the normal, or nondysplastic, kidney that lead to kidney failure will need a kidney transplant or blood-cleaning treatments called dialysis. National Kidney and Urologic Diseases Information Clearinghouse (NKUDIC). "Kidney Dysplasia." National Institute of Diabetes and Digestive and Kidney Diseases (NIDDK), NIH. 2 Sept. 2010. <http://kidney.niddk.nih.gov/kudiseases/pubs/kidneydysplasia/>. What did your doctor prescribe for kidney dysplasia treatment? Does your child have kidney dysplasia? What were the events that led to a diagnosis of kidney dysplasia?